2014 has been another great year for sports publisher BackPage Press. In April, their translation of Andrea Pirlo’s brilliantly original autobiography became an overnight bestseller and in October they released the English language edition of Martí Perarnau’s groundbreaking Pep Confidential to widespread critical acclaim. 2 books, 2 hits – with a success rate like that, if BackPage was a striker, it’d be challenging Messi and Ronaldo’s reign. I caught up with one half of BackPage, Martin Greig, to talk books and European football. 1. Do you see the boom in interest in European club football as a widening of tastes or a movement away from British club football? I think it’s more a widening of tastes. The growth in popularity of Spanish football over the past 10 years has been very exciting, particularly as it has coincided with the resurgence of Barcelona under Frank Rijkaard and then Pep Guardiola. I don’t think people are moving away from British club football so much as revelling in the fact that they now have a much broader choice. 2. Do you feel like British football is currently lacking eccentric, articulate characters like Pirlo & Pep? Or is it more a case of European football being a bit more open, with more access for the media? I think British football has characters, but Pirlo, Pep and Zlatan are exceptional personalities. It just so happens that these books have came out in close proximity, but there may not be any more like them for a long while. In Pirlo and Zlatan’s case, I don’t think it is a question of better media access. Gabrielle Marcotti made the point that the Italian press had witnessed very few signs of the quirky personality that emerges in Pirlo’s book. These players are doing it on their own terms, but the difference is that Pirlo and Zlatan have the confidence and class to steer away from the bland, cliche-ridden claptrap that often passes for footballer (auto) biographies. 3. Was tapping into the European football book market always a plan for BackPage? Yes. Our first book, on Spurs and Dundee legend Alan Gilzean – In Search of Alan Gilzean – was aimed at a British market, but the plan after that was always to try and break into other markets. Our second book, Graham Hunter’s Barca: The Making of the Greatest Team in the World, was the perfect vehicle to achieve this: the story of a team who had become a global phenomenon, written by a journalist with an international reputation. 4. How did the Pirlo project come about? Were there other publishers competing for the English language rights? It came out in Italy about 12-18 months before we published it. We have been following Pirlo’s career very closely for years and, when the book came on our radar, we knew we had to get a deal done. 5. Did you make any changes to the Italian version? Pirlo insisted on the subtitle ‘I Think Therefore I Play’ remaining the same in English. He – along with the Italian journalist who ghost-wrote the book, Alessandro Alciato – had a strong sense of the kind of book they wanted it to be. We made some minor changes, mainly trying to fill in any possible knowledge gaps with the use of footnotes, but we didn’t have to do much to it. 6. How was the translation process? Did the Italian co-author Alessandro Alciato work with Mark Palmer? The translation process was a joy. Myself and Neil [White] had worked with Mark in journalism a few years ago. We knew he was an excellent translator, but also a superb journalist who knew how to tell a story in the best way. Mark read the initial manuscript and all the reviews. He told us it was really good, but as he was translating it he got more and more excited about the material. Mark went to Italy to meet the editor of the Italian edition, to help clear up a few issues, but had minimal contact with Alessandro, though I did meet him myself earlier this year in Madrid. It was before the book came out and, when I told him that I thought the book would be really big, he looked at me as if I had two heads! As an Italian, I guess Alessandro didn’t quite grasp the esteem in which a British audience holds Pirlo. 7. How did the Pep project come to your attention? With this one were you involved from the outset? A journalist called Lee Roden spotted a tweet by the author, Martí Perarnau, saying that the rights for his Pep book in Spanish had just been sold to a German publisher. Lee dropped us a line to say it might be worth checking out if the English-language rights were available. I remember getting a call from Neil about it. I was down in Manchester with Graham Hunter doing an event. We asked Graham about Martí and he confirmed that he was a very well-respected journalist in Spain with a close relationship to Pep. When we got the manuscript, we read the introduction where Martí quoted Pep as saying to him: “I’ll give you total access. Write about anything.” We moved quickly after that! 8. Was anything edited in or out of the English version? Was Martí involved in the translation? Martí wasn’t involved in the translation, but he has been incredibly helpful throughout. We had a brilliant, football-savvy translator, who really engaged with the material, which gets quite technical in parts. As such, it didn’t take a big edit, though we worked very hard on getting the balance right in certain areas of the book. It’s obviously a sympathetic portrait of Pep – though definitely not uncritical in parts. Critics may say that it is overly sympathetic, but I think that is to completely miss the point. This is one of the best managers in the world laying out his coaching blueprint. It’s unprecedented. That was only able to happen because of Martí’s relationship with Pep. 9. 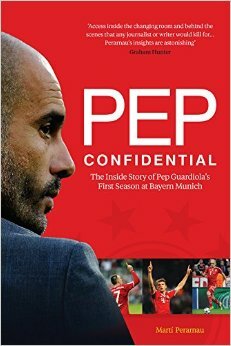 Pep Confidential is published in partnership with Arena Sport. What’s the story there? We’re friends with Pete Burns, who runs Arena Sport, which is an imprint of Birlinn. We had discussed working together in the past and, when Pep Confidential came up, we were rushed off our feet with Pirlo. We spoke to Pete about the possibility of joining forces, and it’s worked out well. 10. How have you found your experiences of newspaper serialisation? On the one hand, of course, it’s great exposure but on the other, sometimes people feel they’ve already read the best bits. Some people may read every word of a serialisation and then decide they don’t want to buy the book, but I would argue they are in the minority. The argument is much more about awareness. I think the vast majority of people will catch bits and pieces, and if you can pique their interest, then they become potential readers. Newspapers get a real kicking these days, but traditional media remains very powerful. The media model is obviously changing and no newspapers are going to throw around big serialisation fees any more, but publishers and newspapers can still work together creatively. 11. What football book this year do you wish you’d been able to publish? Dennis Bergkamp’s book was excellent. He’s one of my all-time favourite players and the book more than did him justice. I’m a fan of David Winner’s writing and loved Brilliant Orange, so it was exciting to read the Bergkamp book. 12. What’s on the cards for 2015? We’re publishing the definitive book on Ferenc Puskas. We’re also starting sports book podcasts in association with Waterstones. We’ll be interviewing the author of one new release a month and the author of one classic sports book a month. We want to increase the conversation around good sports books. We’ve got two or three other projects which are not 100% confirmed yet. Obviously, Of Pitch and Page will be the first to know!